Hello Nerfplz fam and welcome to the latest edition of the tier list, newly updated for the chaos known as pre-season. Since all the article links are now outdated, I've cleaned it up a bit. Don't worry, we'll be populating them back with new content shortly, especially since there's just so much to talk about! This time around it looks like assassins are taking over the rift based on the FOTM tier list, but tanks have a secret weapon on the revolve tree known as the rune Overgrowth. If you're looking for some easy wins, just drop in a tank or two while the rest of the population is busy focusing on squishy assassins. Anyway, check out the list below and stay tuned for some more updates on what's strong and what's not! Darius [Tier 2 Top] - Darius is one of those champions that is in the middle of a crossroad right. He's got a super high play rate, and people really enjoy his style. However, old Darius players are used to being a crazy lane bully and are currently stacking the damage runes on the old chap. Meanwhile, his most successful setup is via the resolve tree, making him into a powerful front line like every good melee champion was born to be. I think that as players move away from the old mindset into the new, we'll find him to actually be balanced in his current state. 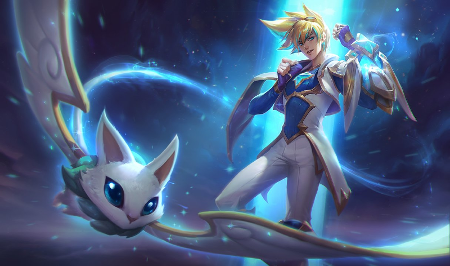 Ezreal [God Tier Marksman] - Kleptomancy Ezreal is ridiculously broken right now, and you should probably be playing or banning him in every game. His poke damage is crazy high, and every time you land a Q you can generate bonus gold and potentially a consumable. He's still most popular as a marksman, but quickly gaining popularity in pretty much every role considering his state. I'll do a post on him later. Gangplank [Tier 4 Support] - Some of you might be considering running Gangplank as a support after seeing Kleptomancy, but I'd advise against it. He's still a relatively close range fighter, and the result of more poke champions and more free sight runes in the game means he'll have difficulty controlling the bush or proccing his barrels unless you're just that good. Summon Aery champions will also tear him to shreds. Katarina [God Tier Mid] - The new runes on Katarina are bonkers, and allow her to get the first kill via stored damage and then snowball from there. All in all, it seems like everything synergizes perfectly with her kit. Leona [God Tier Support] - The addition of Second Wind allows Leona to finally compete on even footing with all the annoying heal-based supports. When you combine this with the new burst damage abilities on marksmen, bot lane becomes much less of a sustainfest. Miss Fortune [God Tier Marksman] - When you combine the Sorcery/Precision runes to her already oppressive lethality build, the idea of one-shotting an enemy champion no longer seems so far away. Morgana [Tier 1 Mid] - Morgana's always been a bit of lackluster mid laner due to her lack of flashy skills, but she's also always been one of the safer ones. The new runes allow her to sustain her mana indefinitely via Manaflow Band, and Arcane Comet is essentially a free damage boost if she hits her binding. Rammus [Tier 1 Jungle] - As a champion that gains a ton of free stats via his Defensive Curl (W), Overgrowth on Rammus gives him considerably more in the way of effective health than it does most other champions. Shen [God Tier Top] - Similar to Rammus, Shen gains a ton from the new Overgrowth rune since almost all his skills scale off health. Sona [God Tier Support] - Sona's been hotfixed mid-patch since her release, but her win rate still maintains a relatively high status despite this. Her damage and shield power via Summoner Aery is incredibly overpowered, and she'll likely maintain a high status unless she gets power nerfed into the ground. Teemo [God Tier Top] - Teemo's newfound success is also attributed to Summon Aery, which can actually proc TWICE off a single poisoned auto attack as long as he maintains his range. Combine this with runes like Scorch for bonus harass damage and Ravenous Hunter/Taste of Blood for lane sustain and it's impossible to trade with him. If you're a melee champion, you might as well request a lane swap. Teemo [Tier 2 Support] - As a support Teemo sounds like he could be decent based on his crazy top lane advantage, but he suffers a lot from the fact that he now has to deal with two ranged champions instead of one melee champion. At worst, he'll need to deal with something like Miss Fortune + Sona, which can easily one-shot him if he gets too close.